For my Burger Month review, I went for a two-in-one review of sorts. It wasn’t planned and it was just because of pure, dumb luck, by the way. If you want to find out if it was good or bad luck, read on! I was stuck in the Greenbelt area due to ungodly traffic. Since I couldn’t go home, I decided to get a bite to eat but most of the restaurants were full. While searching for a place to eat, I came across Burger Bar. I was drawn to it because of the… uniqueness of the place itself. 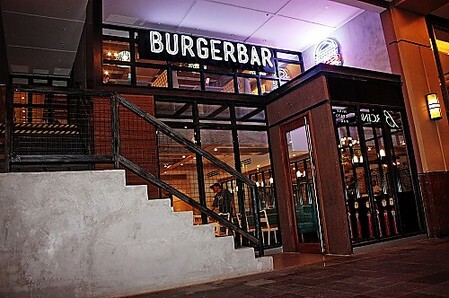 While most restaurants are located on the ground level of Greenbelt, Burger Bar was different. You had to climb a flight of stairs in order to get to the restaurant itself. That intrigued me and, since I was looking for a burger joint to review anyway, I decided to climb on up and see if the burgers are as uncommon as the restaurant’s look. When I first saw the menu items, I wanted to try assembling my own burger using the You’re The Boss section. Essentially, if you order from this side of the menu, you can have your burgers made to order! You can even choose what cut of beef you want to include in your meat patty! In the end, even if I was intrigued by the idea, I decided against ordering this. I didn’t want to create some ugly monstrosity by mistake and then blame Burger Bar if I got a lousy burger. I chose to play it safe and just order one of the regular items. Next time, Burger Bar! Next time. I was going to go for The Piggy as it had bacon (which sort of became a theme for this year’s Burger Month) but, since it had bacon jam just like Brothers’ Extreme Bacon Burger (which I reviewed last week), it would be wrong to do so as I might think The Piggy wasn’t original. Gee, I couldn’t believe I was having a problem finding something to order! 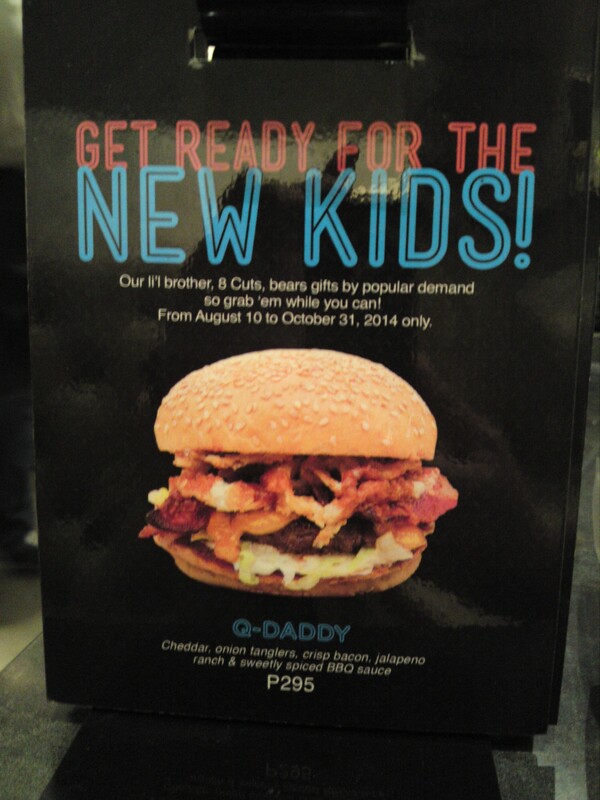 By happenstance, my eyes fell on a poster promoting their limited special, the Q-Burger! While this is also available in their “junior” branch, 8 Cuts, I decided to order it. Seems like I’m killing two birds with one stone here as I’m essentially reviewing two burger joints: Burger Bar and 8 Cuts! Hurry! Available for a limited time only… unless you go to 8-Cuts! Now, I chose the Q-Burger not because it was only available for a limited time (until the end of October, by the way), but because it had bacon (like I said, it was a theme) and had something I never tried in a burger before: onion tanglers, which are essentially fried onion rings. Well, I love onion rings so that sealed the deal for me! I just gotta try it now! When I got my order (with fries and soda, of course), I have to say I liked what I saw! 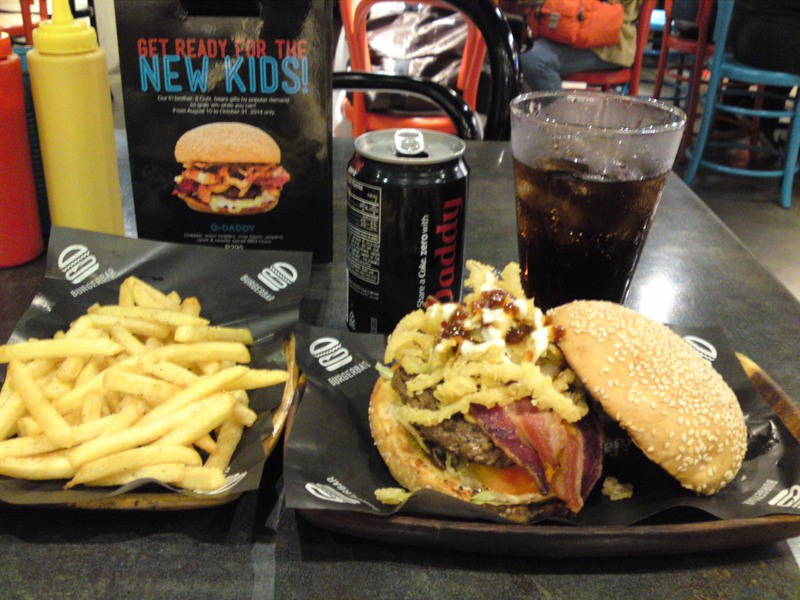 The Q-Daddy is a pretty decent sized burger and it was fully loaded with stuff! I always appreciate it when a burger joint doesn’t scrimp on the toppings and Burger Bar didn’t disappoint! There was a large amount of onion tanglers, which I hoped would happen! The bacon also looked good, too! While they seemed to droop over the side of the burger, they looked like they were seared properly. My can of Coke Zero says Daddy… for Q-Daddy? Of course, I didn’t come to Burger Bar to admire pretty food presentation. I came there to eat! And I would have to say that Burger Bar has one of the most juiciest burgers I’ve had! The instant I took a big bite into the Q-Burger, meat juice goodness started to ooze out! Wonderful! The BBQ sauce provided the perfect tangy flavor to accompany the meat, lending a good smoky flavor. Also, the onion tanglers lend a good texture contrast, as they provided a satisfying crunch with the first and second bites I took out of the Q-Burger. I was also enjoying the bacon… until one entire strip came along around my sixth bite. Apparently, one of the pieces of bacon wasn’t cooked well enough as it didn’t break off when I chomped on it. I always find this annoying as I have this need to savor the bacon and not have it come along for the ride! A minor gripe but it’s still a gripe. Now, while I really enjoy a messy and juicy burger, it was fairly troublesome to keep my shirt clean while I chowed down on the Q-Burger. Flakes of onion tanglers would fly out with each bite or succulent liquid fat would dribble down my mouth while I chewed on the burger. I can’t fault Burger Bar for making an excellent juicy burger as this but you may want to wear a bib just in case. See? I left a puddle of meat juice after I finished! All-in-all, I would have to say I thoroughly enjoyed the Q-Burger. 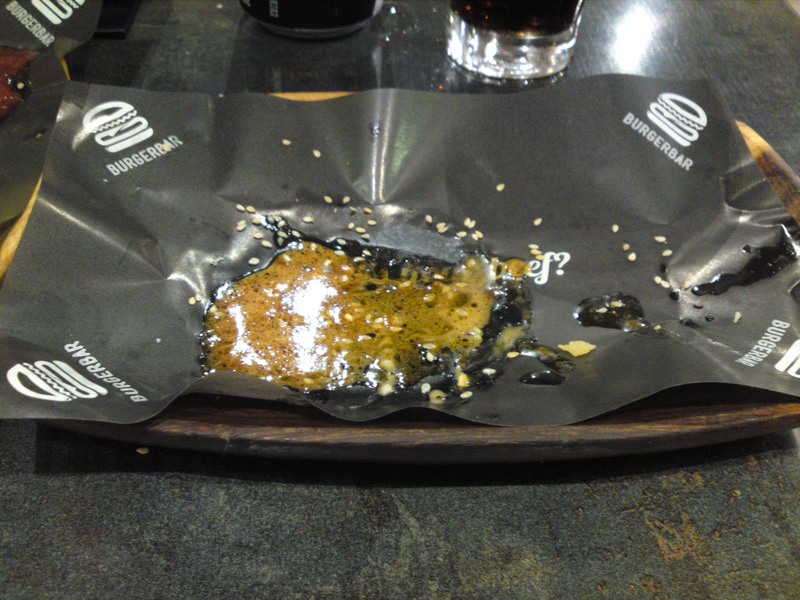 It was definitely a good burger and I left Burger Bar satisfied and with a smile on my face… and a couple of new stains on my shirt. Maybe next time, I’ll be more adventurous and try making my own burger. If all of the meat mixtures are this good, then I guess my trepidation of making a mistake was for nothing. Have you tried eating at either Burger Bar or 8 Cuts? What was your experience like? Let me know in the comments section below!